The Austrian company Noctua has issued a press release to announce the introduction of the new NT-H2 thermal compound. The award-winning cooler manufacturer claims the second generation of its “enthusiast-grade” paste managed to deliver up to 2 °C lower temperatures in the firm’s tests than the predecessor NT-H1. The thermal paste will be available in 3.5 g and 10 g packages. For those who like to tinker with their computer system’s cooling solution, there is a new product on the market that could be of considerable assistance. Noctua is renowned for creating incredible CPU coolers and fans, and now the company has announced the NT-H2 thermal compound to join its list of products. 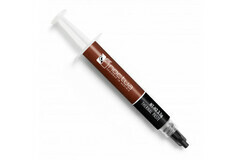 It is the successor to the NT-H1 thermal paste, which has garnered some good reviews over its lifetime. Noctua’s press release offers up some information about the NT-H2 thermal paste, which is apparently a “fine-tuned mixture of metal oxide microparticles for even lower thermal resistance and reduced bond-line thickness at typical mounting pressures.” With this superior mix, Noctua has stated that its latest thermal compound product can shave off up to a not insignificant 2 °C in the company’s standardized tests. The NT-H2 thermal compound will be available in 3.5 g and 10 g syringe-like packages, and it comes with suggested retail prices of US$12.90/€12.90 and US$24.90/€24.90, respectively. Noctua also mentions that the NT-H1 thermal paste is now available in a 10 g package, and the firm has also revealed the NA-SCW1 pack of 20 wipes that are specifically designed for removing paste and cleaning CPUs and coolers.